Changing trends in mourning has led to Douch Family Funeral Directors in Dorset introducing a new website for urns for ashes, cremation and memorial jewellery. The ‘Urns and Keepsakes’ collection from Douch Family Funeral Directors ranges from memorial necklaces to urn keepsakes and are designed to keep the memory of loved ones alive. Douch Family Funeral Directors have examples of the products in its branches so people can see, touch and feel them. 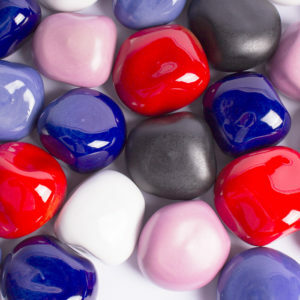 The online shop means they are easily accessible and already, the products are popular with relatives. After a cremation, all or part of a person’s ashes can be retained and more people want to keep a physical memory of a loved one. The products also include ‘cuddle stones’ which contain ashes, are meant to be held and are available in a variety of materials. The Urns and Keepsakes range is the latest innovation from the Douch Family who have eight branches of funeral directors in Dorset. 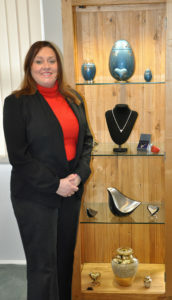 Marcella McDonagh with the new range of products. Buy urns, LoveUrns, urn keepsakes and cremation jewellery online here or call to learn more on 01258 453425 or email [email protected]. Douch Family Funeral Directors’ branches are Douch & Small funeral directors in Wimborne, AE Jolliffe & Son funeral directors in Ferndown, Lesley Shand funeral directors in Corfe Mullen and Blandford, Ives and Shand funeral directors in Parkstone, James Smith funeral directors in Swanage, and Albert Marsh funeral directors in Wareham and Upton.